1. Make sure 32 bit image is same version as 64 bit version. 2. Install the 64 bit. 3. Do a backup from 32 bit image and check "Meta data backup" while doing the backup. 4. Do a restore on 64 bit image. 5. Make sure to change your IP/DNS settings on 64 image and shutdown the 32 bit image(because you might have 2 machines running scheduled jobs). 6. Optional: Base 64 image comes pre-configured with 4 GB of RAM and 2 vcpu. You can increase the memory and CPU as per your environment. You can check the versions from Tools > Update from the main app. Or you can compatibility from appliance manager restore section. and the size of VM is different as well. By default: 2 GB RAM, 2 vCPUs and 50 GB of HDD. 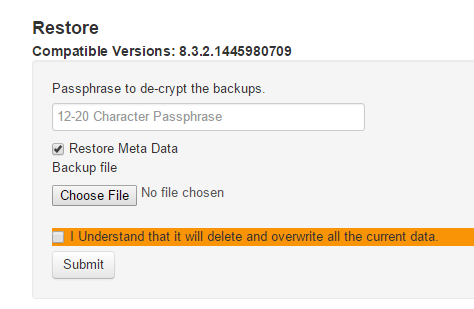 Make sure to backup meta data when taking the backup from 32 bit appliance. Do the restore on new appliance and make sure restore meta data is checked. Do the IP settings for 64 bit as per your environment (static IPs/DNS etc.) and make sure to shutdown 32 bit appliance. 4 GB RAM and 2 vCPUs are good for upto 2500 devices. If you have lot more devices and are running lot of auto-discovery jobs, you can add additional CPUs/cores and memory.